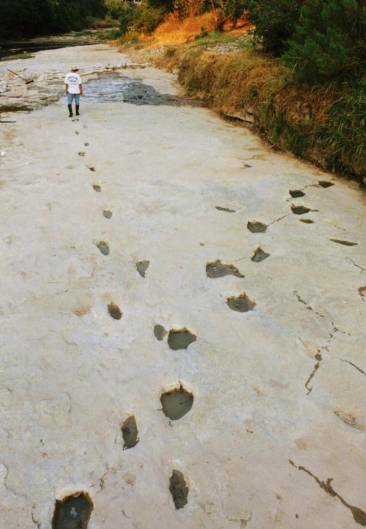 Dinosaur and human tracks discovered together at the Paluxy River in Texas show forth new facts concerning the Genesis Flood. The sedimentary rocks of Texas indeed tell a strange and intriguing story, supporting the biblical record of a worldwide flood in Noah's time (Gen 6-9). An artifact was found in Ordovician strata near London, Texas. The stone, according to evolutionists, is over four hundred million years old yet the artifact is an iron hammer, clearly manmade. How could a manmade object have been made four hundred million years ago? What buried it in sedimentary strata deep in the heart of Texas? The major excavation was at the Paluxy River area, four miles out of the little town of Glen Rose, Texas. Thousands of tourists visit here every year to see the state park where evidence has been brought together to show that more than a dozen different types of dinosaurs roamed these Cretaceous beds at some time in the past. The intrigue and the mystery of this whole area has been enhanced by the many reports of human tracks, as well as dinosaur tracks, found in the strata on the area of this riverbed for more than fifty years. 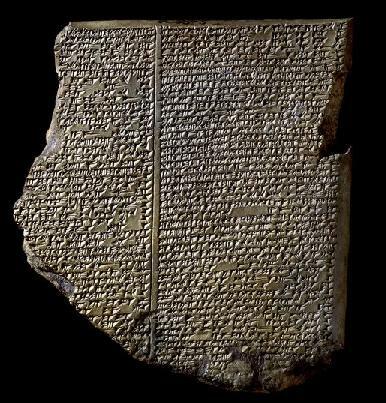 Many historians were not convinced that society during the time of Abraham operated under a universal code of ethics, until Hammurabi's Code was discovered (Hammurabi, king of Babylon, 1792-1750 BCE). This artifact pointed to a well-developed system of jurisprudence and demonstrated that literary skills during that time had reached a remarkably advanced stage. After Israel left Egypt, they attempted to settle in the land promised to their fathers: Abraham, Isaac, and Jacob. Omri, Israel's sixth king, had conquered Moab. 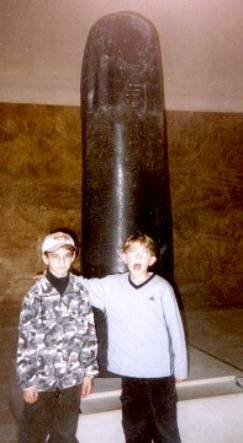 Mesha, king of Moab, was able to throw off the tribute that Omri had imposed on them years earlier. The Moabite Stone (850 BCE) was written by Mesha to commemorate his successful revolt from the yoke of Israel. When Israel had settled in the promised land, they wanted a King to rule over them. God was not in favor of this, but allowed them to taste the bitter flavor of their decision. In time, kings would eventually split the nation in two and cause the people to worship idols. Eventually, God punished His people by expatriating them to other lands. Assyria took the northern tribes. 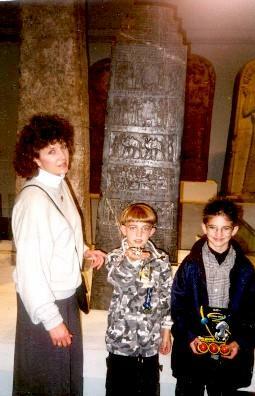 The Black Obelisk (9th cent. BCE) details this captivity, depicting King Jehu bowing to Shalmaneser III. It is the only image we have of a pre-exilic Jewish king. Sargon II was founder of the last Assyrian dynasty. He dispersed the Jews so widely they became the lost tribes of Israel. 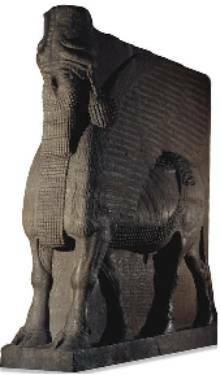 Sargon II had Winged Bulls (8th cent. 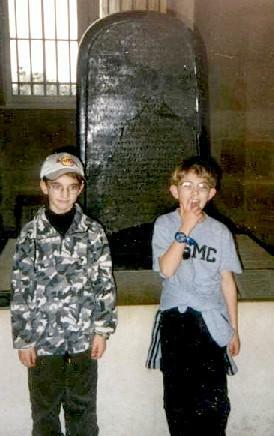 BCE) placed at the entrance to his palace. 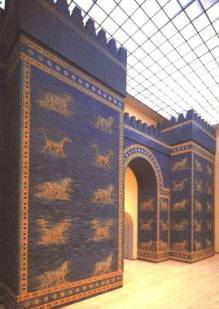 When Babylon took control of the world from Assyria, Nebuchadnezzar spent much of his time in building projects. 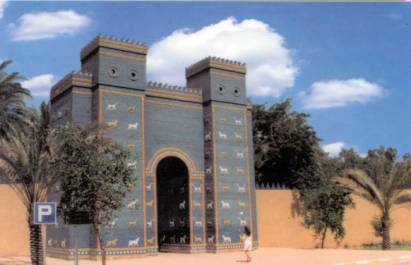 Of these, the Gates of Ishtar (6th cent. BCE) stand as a reminder of the splendor of his day. It was during the Persian Empire that the Jews were allowed to return back to Jerusalem and rebuild the temple. Xerxes I (486-465), son of Darius, tried to annex Greece. He captured Athens and burned the Acropolis. But he failed in his quest for Greece. Xerxes I is King Ahaseurus in Ezra and Esther.